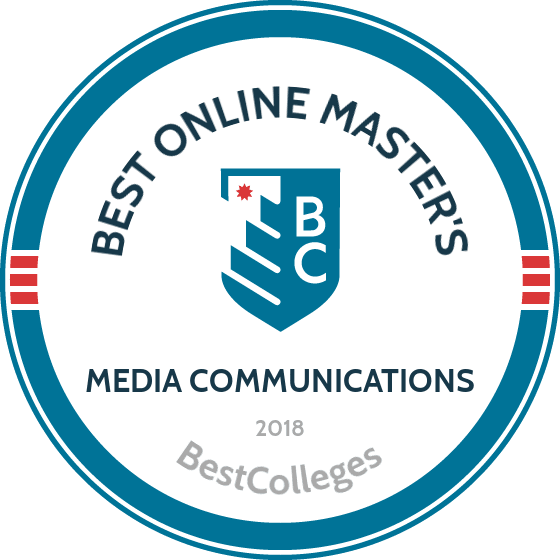 WHAT ARE THE BEST ONLINE MASTER'S IN MEDIA COMMUNICATIONS PROGRAMS? What Else can I Expect from an Online Master's in Media Communications Program? A master's in media and communication open doors to careers in marketing, radio, television, journalism, and public relations. The annual salary potential can exceed $60,000, depending on occupation. Opportunities for graduates with an online media and communication master's degree will increase as media industries continue to grow. Below is information on universities, graduate programs, and careers to help you make an educated decision for your future. UF created the first online master's degree in mass communication media studies program that allows students to specialize in digital marketing. The 36-credit master of arts in mass communication with a specialization in digital strategy includes 33 credits of class work and a three-credit capstone. The program teaches students about lead generation, management, and engagement in the digital world. The curriculum is taught on a semester schedule. Full-time students can complete all degree requirements in two years. Courses are taught asynchronously, but weekly assignments must be submitted by their assigned deadlines. Each semester lasts 12 weeks. Students may enroll in the fall, spring, or summer. Applicants should submit official undergraduate transcripts and GRE scores. International students may need to demonstrate English proficiency. Florida residents receive a discounted tuition. Graduates are prepared for many careers, including chief marketing officer, online marketing director, and digital marketing director. Michigan State's MA in strategic communication emphasizes targeted communication that is based on proven strategies. Students study a broad range of topics, including communications ethics, crisis management, and persuasion techniques. The 30-credit program consists of a nine courses that are taught by experienced faculty. All students must complete a capstone project. Classes include brand image and communication, evaluation techniques for working professionals, digital media strategies, and strategic message development. The curriculum teaches students how to integrate marketing, advertising, sales, and logistics across physical and digital channels. Individuals who have worked in the communications field for three or more years are welcome to apply. A bachelor’s degree is required. The university is located in East Lansing. Michigan residents receive discounted tuition, and students are not required to provide GRE scores. Graduates are prepared for careers in advertising, public relations, and more. Iowa’s online master's in strategic communication curriculum prepares students for a number of careers in the field, including crisis communication, political campaign development, healthcare communication, and social media. Students take 15 credits of core courses and at least 15 elective credits, which allow students to follow personal and career interests. There are 12 program electives, and students may pursue electives outside of the program if they are relevant to professional goals. The curriculum culminates with a capstone project. The program includes online, synchronous classes, which meet once a week in the evenings. Applicants must have a bachelor’s degree with a minimum GPA of 3.0. A professional resume, writing sample, statement of professional goals, and three letters of recommendation are also required. Up to two courses may be taken as a non-degree seeking student prior to admission. Students are not required to submit GRE scores. The New School, located in New York, offers an asynchronous online media and communication master's with a thesis and non-thesis option. Both options consist of 39 credits, which includes two core courses, two production courses, and one research methods course. Most of the credit requirements are fulfilled through electives. Recommended areas of study include transmedia and digital storytelling, digital cinema production, and media analytics. Students have the flexibility to organize a curriculum that is beneficial to their professional and personal interests. The thesis option prepares students for Ph.D. programs. Students may apply for fall and spring admission. Applicants should submit transcripts, a statement of purpose, their resume, writing samples, and an optional creative sample. All students pay the same per-credit tuition rate. Online learners are offered the opportunity to earn credits through internships. FIU’s online media and communication master's degree prepares graduates for upper-level positions in advertising, public relations, government communications, and more. The 30-credit MS in mass communication: global strategic communications program emphasizes communication management and digital communication. Students take five core courses before pursuing electives. There are 14 electives to choose from, including an independent study. The program, which takes 12 months to complete, culminates in a professional project. Courses complete six eight-week terms, which is equivalent to four courses per semester. Courses include applied research methods in mass media, ethics and social responsibility, global strategic communications management, and theories of mass communication. Applicants should submit official transcripts, a resume, a personal essay, two letters of recommendation, and GRE scores. The program starts in the fall and spring, and tuition is the same for in-state and out-of-state students. Webster University, located in St. Louis, Missouri, offers an online master of arts in media communications program. The curriculum consists of 36 credits and includes core and elective courses, which provides students with fundamental knowledge and the flexibility to pursue professional and personal interests. By learning various research methodologies, graduates can analyze media in cultural, economic, and political contexts. Admissions decisions are based on academic qualifications and relevant work experience. Students may be admitted without relevant coursework or work experience. Learners without such experience must take six credits of prerequisites and earn a minimum grade of B. Every student who enrolls in the program must consult with an academic adviser. Tuition is the same rate regardless of state residency; military students receive a significant discount. Texas Tech’s online master’s degree in media and communication trains senior-level communications professionals. The 30-credit program is offered asynchronously, allowing students to take between one and three courses per semester. Seven courses are required, and three are electives. Required courses include strategic communication planning and writing, communication in organizations, strategic communication in a global environment, and research methods. Four start dates are offered throughout the year in the fall, spring, and summer. Applicants should have completed a bachelor’s degree with a minimum GPA of 3.0. Students who do not meet the GPA requirement may use GRE scores to substitute, but in general, the GRE is not required. Other application materials include a personal statement, writing samples, three references, and a resume. The university is located in Lubbock, Texas. Online students pay the same tuition rate as Texas residents. South Dakota State’s master's in media and communication program works with professionals in the field to maintain a current curriculum. The master of mass communication program prepares students for careers in advertising, marketing, public relations, and print and broadcast journalism. Students may pursue a 32-credit or 36-credit option. The 32-credit option culminates with a professional project, while the 36-credit program requires students to complete a professional portfolio. To facilitate peer interaction, students go through the program as part of a cohort. Learners take four eight-week classes, which are split into two sessions, per semester. Discussion boards are an essential part of the curriculum, and half the coursework consists of hands-on skills training; most instruction is asynchronous. Applicants should have a minimum undergraduate GPA of 3.0 and must submit official transcripts. Tuition is the same for in-state and out-of-state students. The 30-credit master of arts in strategic communication takes a multidisciplinary approach that teaches traditional and new media. The new media portion of the curriculum emphasizes hands-on training in graphic design, audio and video software, new media publication layout programs, and more. Students go through the program as a cohort and have weekly access to their professors through designated online office hours. The program includes 12 credits of professional courses, 15 credits of communication courses, and a three-credit capstone project. Courses include professional multimedia content creation, ethics for professionals, professional digital content promotion, and research methods for professionals. Students may enroll in the fall, spring, or summer. Applicants must submit official undergraduate transcripts and have earned a minimum GPA of 3.0. GRE scores are not required. Application requirements include a written statement of purpose. Austin Peay State offers an online master's degree in mass communication media studies. The university’s master of arts in communication arts program is available with two specializations—corporate communication and general communication—and two concentrations—marketing communication and media management. Specializations are not printed on degrees or transcripts, but concentrations are. All specializations or concentrations require students to earn at least 34 semester hours. Corporate communication courses include communication research methods, communication law, and integrated corporate communication. Prospective students with a minimum undergraduate GPA of 2.5 will be considered for admission, but must submit GRE scores. Applicants with a minimum undergraduate GPA of 3.5 are not required to take the GRE. Three letters of recommendation are also required. The university is located in Clarksville, Tennessee. State residents receive a discounted tuition. National’s master of arts in strategic communications consists of 45 quarter units that are spread across 10 classes, which includes nine core courses and one elective. Up to four and a half quarter units may be transferred into the program, provided that those units were not used to satisfy requirements of a previously awarded degree. Students may pursue an elective from any graduate department if they have completed that course’s prerequisites. The program concludes with a capstone project. The program emphasizes a strategic approach, teaching students to become communications leaders. Admissions decisions are made on a rolling basis, and there are multiple start dates throughout the year. Applicants should submit transcripts from all prior institutions of higher learning. Applications are evaluated based on academic achievement, pre-graduate test scores, work experience, statements of professional and educational goals, and relevant work experience. An interview may be necessary. The 36-credit master of science in mass media arts is offered entirely online and can be completed 18 months. Students take seven core courses that develop professional writing and technology skills, a focused interests course, six credits of research geared toward thesis writing, and two electives. In addition to research, the curriculum emphasizes developing practical skills that are immediately applicable in the workplace. The program also serves as preparation Ph.D. studies. Applicants should have earned a bachelor’s degree with a minimum cumulative GPA of 2.75. A personal statement, letters of recommendation, a resume, and GMAT or GRE scores are also required for admission. High pre-graduate examination scores may substitute for a GPA that is below 2.75. Pennsylvania residents pay reduced per-credit tuition. Southern New Hampshire University's master of arts in communication in new media & marketing program may be completed in 15 months. Coursework is available asynchronously. The 36-credit, 12-course curriculum covers digital tools, ethics, law, personal branding, strategy, and more. A final capstone project helps reinforce learned professional skills. Admissions decisions are made on a rolling basis. There are multiple start dates throughout the year. In addition to providing undergraduate transcripts, applicants should submit a statement of purpose and a writing sample. Applicants with a minimum undergraduate GPA of 2.75 are typically granted provisional acceptance. Some students may be required to take an introduction to graduate studies course. The university is located in Manchester, New Hampshire. In-state and out-of-state students pay the same per-credit tuition rate. Edinboro’s master of arts in communication studies is available with four concentrations: managerial and leadership communication, integrated marketing communication, intercultural and international communication, and public communication. Each concentration’s curriculum includes 36 credits and culminates in a comprehensive examination and portfolio presentation, thesis, or practicum. Students who elect to take a comprehensive examination, take 18 credits of electives. The other two options have a heavier emphasis on research. Applicants must submit undergraduate transcripts, a statement of purpose, two letters of reference, and MAT or GRE scores. Applicants with a minimum undergraduate GPA of 2.8 and two years of relevant work experience are exempt from pre-graduate testing. Students who have completed a prior graduate degree are also exempt from testing. Applicants without any relevant full-time work experience may be required to participate in a six-credit internship. State residents pay a discounted tuition. Valley Forge’s online media and communication master's in digital media is available as a fifth year add-on for Valley Forge digital media undergraduates or as a two-year degree for students who earned their bachelor’s degree elsewhere. The master of digital media communications program consists of 33 credits, six of which are dedicated to a final directed project. Students learn how to research, evaluate, and develop new digital communication trends in conjunction with the university’s Christian worldview. Students should submit all undergraduate and graduate transcripts that showcase a minimum cumulative GPA of 2.75. GRE scores are not required, but applicants should submit a digital portfolio of their work along with a letter of reference. Faculty interviews are conducted prior to making admissions decisions. The university is located in Phoenixville, Pennsylvania. In-state and out-of-state online students pay the same per-credit tuition rate. Curricula, required time commitments, and schedules for online master's degree in mass communication media studies programs vary by school. However, the information below represents the typical student experience. Curricula for media communication programs generally focus on marketing and research methods, areas of mass communication, and leadership and business skills. While classes vary by program, below are sample courses typically required during the completion of a master's degree in media communication. Media and culture: This course covers concepts and theories regarding the impact of media and technology on culture, families, and communication. Students may analyze their own communication patterns and skills. The course prepares students for careers in marketing and advertising. Media law and ethics: This course prepares students for careers in public relations and communication. Rapid advancements in technology require strong personal ethics and a deep understanding of policy and legal issues. Communication capstone: Many online media and communication master's programs require a capstone course. This professional project, completed near degree completion, integrates coursework into a practical, real world experience, such as the development and execution of a communication campaign. How Long Does It Take To Get An Online Master's In Media Communications? Online media and communication master's programs typically require 30 to 36 credits, which full-time students complete over four semesters. This timeframe varies based on the student's availability and the program structure. Students who want to complete the degree as quickly as possible, or who prefer to take one or two classes at a time, should consider individually paced programs, which allow students freedom over the course structure. Cohort-based programs, on the other hand, require all students to progress through the program at the same pace. As online learning gains popularity, accreditation becomes even more important. When evaluating a potential school for your online media and communications master's degree, ensure the institution is regionally or nationally accredited. Accreditation means the college or university meets and maintains certain educational and operational standards. Regional accreditation is older and more prestigious than national accreditation. Regionally accredited schools do not not typically accept transfer credits from nationally accredited institutions, but this is rarely an issue for graduate students. Along with investigating a school's accreditation status, students should research the accreditation agency itself. Two organizations are responsible for overseeing the quality of the nation's higher education by validating accreditation agencies: the U.S. Department of Education (ED) and the Council for Higher Education Accreditation (CHEA). Accrediting agencies must meet certain standards to be validated by these organizations. Both the ED and CHEA offer databases of accredited schools on their websites. Graduates with an online master's degree in mass communication media studies have the knowledge and skills to compete in many fields and industries. While potential careers are varied, most opportunities require excellent communication skills, an understanding of mass media, and the ability to work outside normal office hours. Film and video editors manipulate images for television, film, and other media. Editors typically work in office settings or studios and are skilled with digital software. Camera operators work in video industries, radio, and television broadcasting. While full-time positions typically require a bachelor's degree, those with a master's of communication in digital media often run their own freelance businesses. Producers work in television, film, or for companies with producing needs. Producers oversee all aspects of video creation, including scripting, shooting, editing, and acquisition of talent and equipment. Market research analysts interpret information from reports, such as media and marketing efficacy, and offer recommendations. Successful analysts are excellent at multitasking, time management, and focusing on details. Public relations specialists Public relations specialists promote and create awareness of a company or brand through media outlets. This position requires outstanding communication skills and the ability to work with multiple departments. Due to the wide range of careers open to master's degree holders, salary data varies widely. Starting salaries depend on industry and employment status. Despite the variability in earning potential, most careers in the field display increased salaries for experienced professionals. One of the most pressing issues for higher education students is cost and affordability. While a master's degree can be a costly investment, students can secure funding to reduce out-of-pocket expenses. Complete the Free Application for Federal Student Aid, or FAFSA, to take advantage of federal grants, scholarships, and work-study opportunities. Annual scholarships are available from organizations such as the Public Relations Student Society of America, the Alliance for Women in Media Foundation, and the Broadcast Education Association.